Sidhartha Sen Gupta from Miles Bronson Residential School (MBRS), Borjhar, Guwahati is sharing a report on the Service Section. 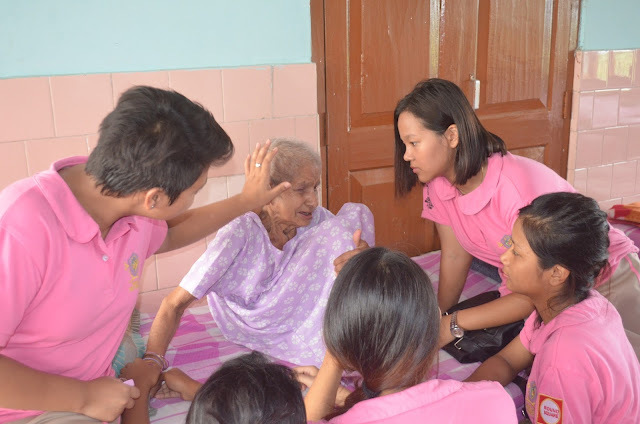 Award participants along with Award Leaders and Mentors from MBRS visited the Missionaries of Charity, Old Age Home in Khanamukh, Guwahati on 15th June 2016 as a part of their Service project. We all were very curious and excited to visit the people over there. We had a good interactive session with the residents of the Old Age Home. We were touched by the sensitive attitudes of these homeless older people, who shared their thoughts and feelings with all of us. Indeed, they poured their hearts out and we were all touched by their stories. They made us feel a kinship, as if we are also a part of their life! We have learned that it’s the adaptability to the environment that is one of the strongest characteristics of a human being. The people we visited there were the epitome of camaraderie, united although all were from different backgrounds, they were happy and ready to lead a better life. We were amazed to see that through our interaction many hearts were rejuvenated! They treated us as their own children by forgetting their sorrows and worries. It was a fabulous experience to see how happy they all were and made us realise that grandparents and parents are gifts of God, which should be preserved with love and care. We promised them to visit again and again on a regular basis. We are thankful to our school fraternity for their whole hearted support and guidance and also for bestowing us an opportunity to extend ourselves to others’ needs, to turn their ‘Tears into Smiles’.